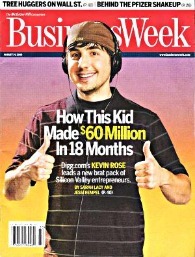 The hits keep coming for Digg; perhaps the dot-com bust era's best renaissance story. This week alone, the company has lost its publisher and chief revenue officer, as well as announced massive layoffs - to the tune of 37 percent of its workforce. Chas Edwards (the aforementioned publisher) has fled to Pixazza, a startup photo-advertising company that has the backing of Google. We recently covered Pixazza's business model here. Kevin Rose recently took over as CEO and that ended in disaster and a quick shift back to his former role. He quipped, "I think of myself as a PM [product manager] and creative director, so it was hard being a cheerleader for 60 some employees — 10 to 15 employees is where I max out." Before long, he just might find himself in that 10-15 employee territory. Like it or not. Naturally, when one business goes belly-up, another prospers. In this case, its Reddit.com. The spartan-styled news submission and voting site has enjoyed a 55 percent increase in traffic from one year ago, according to data from Compete.com. Digg, on the other hand, has seen traffic drop 17 percent over the same period, according to the latest data. And just wondering ... do you think Rose and what's left of the Digg team regret turning down buyout offers that were rumored to be upwards of $100 million? Or this silly BusinessWeek cover from 2006 that looks anything but business-like?